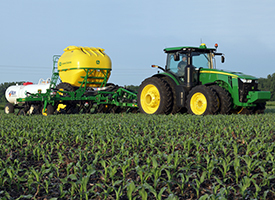 All three of the primary nutrients – nitrogen, phosphorous, and potassium – can be applied at the right time by the 2510H with dry nutrient attachment to feed crops when they most need it. 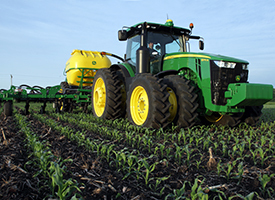 This integrated solution helps producers achieve the 4R objectives for improving application rate, coverage, and accuracy. To further improve the capabilities of this solution. 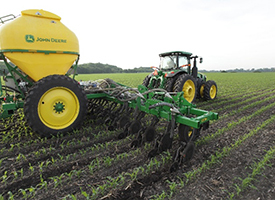 The John Deere 2510H with dry nutrient attachment now has configurations for off-row and on-row dry fertilizer banding in 15-row and 16-row configurations. With a working width of 12.2 m (40 ft), the 16-row 2510H with dry attachment can be used for pre plant and fall applications to apply on row. 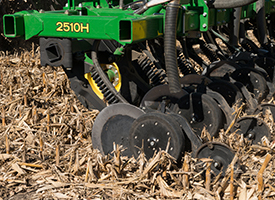 This allows for better matching of the tracks from application with subsequent tasks, like planting. It also makes execution of banding easier. 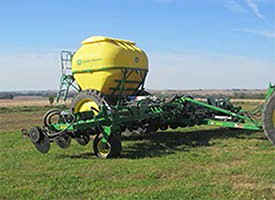 By applying off row, the 11.43-m (37.5-ft) wide 15-row configuration has the additional capability to side dress. 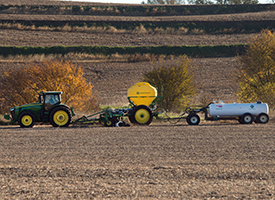 Both configurations offer 6- and 9-ton dry poly tank options that work in tandem with the applicator bar to place anhydrous and dry nutrients in the ground. As an all-in-one, fully integrated package, the 2510H with dry attachment helps provide plants with the nutrients they need, when they need them, to boost yield potential. 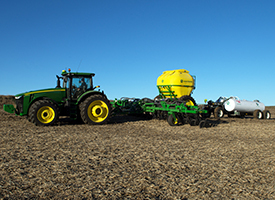 No retrofit options are available to convert an existing 15-row configuration to a 16-row configuration. The 2510H with dry attachment's single-disk opener design improves nutrient stewardship by properly placing nutrients to ensure plants thrive and reach their maximum yield potential while being environmentally responsible. 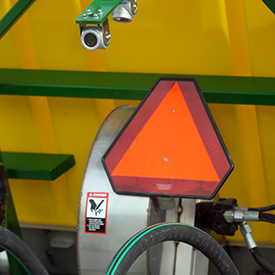 The single-disk opener allows the operator to apply nutrients up to 16 km/h (10 mph). 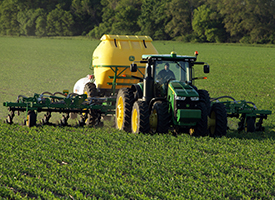 Operators will benefit from proper nutrient placement and realize maximum asset utilization that can quickly apply anhydrous and dry nutrients. This machine delivers a 50 percent increase in equipment asset utilization and application speeds up to 16 km/h (10 mph) to feed plants when they need it most and assisting producers to ensure proper which agronomics potentially reduces application rates and achieves maximum yield. Applying nitrogen (N), phosphorous (P), and potassium (K) in the right place puts nutrients closer to the root zone where they are more readily available. 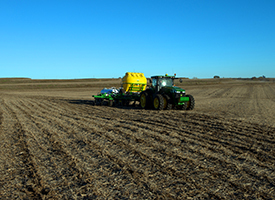 Multiple university studies have shown up to a 20-bushel increase, greater in corn yields, with accurate nutrient placement applied at the right time. 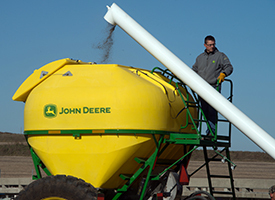 The single-disk opener precisely delivers dry fertilizer up to 114-mm (4.5-in.) deep and anhydrous up to the depth of 140 mm (5.5 in.). 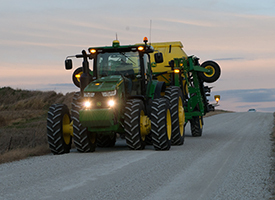 The single-disk opener on the 2510H with dry attachment utilizes a 559-mm (22-in.) blade that is angled 4 degrees to open a narrow slot for the nutrient placement. Reduced soil disturbance and sub-surface application helps implement the nutrient reduction strategy, which is a science and technology based approach to achieving a 45 percent reduction in nitrogen and phosphorus losses to waterways. 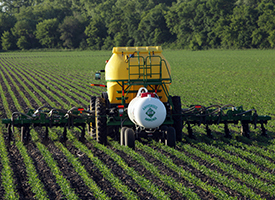 Side-dressing nitrogen (N), phosphorous (P), and potassium (K) in addition to pre-plant N, P, and K application in corn has several advantages compared to pre-plant applications only. Some of the benefits include providing these nutrients closer to when they are needed by the crop, reducing the potential for nutrient losses, and the opportunity to adjust nutrient application rates to achieve yield goals. The underframe clearance on the 2510H with dry attachment is 914 mm (36 in. ).